Philip Garner, founder of Garner’s Garden based in the Washington, DC area, is the first African American entrepreneur to manufacture and produce his own line of toothpaste and antibacterial mouthwash. His oral care products are fluoride-free, and use only all-natural ingredients such as organic neem, tea tree oil, and pepperment oil. Reflecting on how his grandmother only used olive oil for her hands, his first idea was to create all-natural skin care products, such as personal body butters and bug repellants. After sampling his products with friends and family, he began selling them at local farmers markets throughout the DC area. He later expanded his production to hair care, face care, and oral care (which are his most popular products right now), and his company, Garner’s Garden, became an official LLC in 2013. He spent 2 years selling his products at the farmers market before launching his website and ecommerce store in 2015. Although the first year of online sales was tough, making only $3,000 in revenue that year, Garner decided to continue to grow his business organically through word of mouth and direct marketing. By the end of 2016, Garner’s Garden had achieved over $65,000 in revenue revenue. In 2017, the company brought in $225,000 in revenue, all from direct marketing via social media and production out of his basement. In early 2018, Garner moved production from his basement to his first warehouse and distribution center where he currently manufactures and distributes his products. Moving from his basement to a warehouse has allowed him to ramp up his production in efforts to attract retail buyers. With majority of his focus on his oral care products, Garner’s Garden production has increased from producing only 200 bottles of mouthwash a day to 1,200 bottles; all while maintaining his product’s integrity – i.e. quality of ingredients, customer service, and handmade. 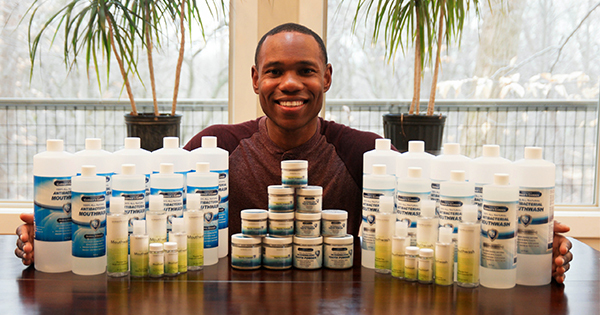 His goal is to disrupt the oral care industry with his natural, fluoride-free oral care products. As Philip’s business continues to grow, his mission to heal the world hasn’t changed. He says his company has a personal touch unlike any other skin and oral care company on the market. “Garner’s Garden is committed to healing the world, one customer at a time,” he says.